Long story short: white people have spent centuries trying to eradicate Native Americans in order to get their land, their resources, and their wealth. That hasn’t stopped. It’s ongoing today. It’s probably happening in your community without you even realizing. It’s happening in North Dakota, and if you’re not aware of the situation, please remedy that right now. 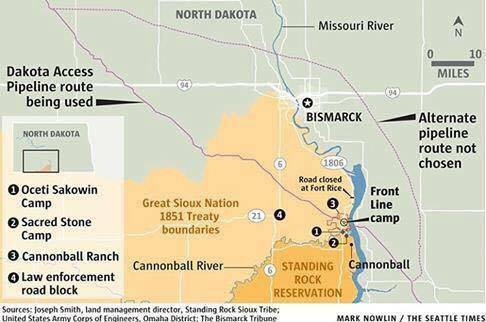 The Standing Rock Sioux are trying to preserve their land and their water from a pipeline that (overwhelmingly white) Bismarck refused to have passing through their city. You know why they don’t want it: pipelines break. They explode. They spill. And for women, there’s a whole other set of horrific problems that come along with a pipeline. We have taken so much from these tribes, and now we’re trying to take more, and this is where it needs to stop. It needs to stop for the health and safety of our indigenous peoples. It needs to stop so that corporations and governments no longer assume it’s no problem to take what they want from the reservations without regard to the residents. It needs to stop for the sake of our land, our water, and our air.